Published on Sunday, August 4, 2013. Show juror Marc D'Estout with award winner Scott McGlasson. Color, form, and movement are at the core of the hand-loomed knitwear of Andrea Handy (booth 607). The fiber artist is fascinated by how the shape and form of clothing can change every instant based upon the body of the wearer and the way that a person moves. Handy's beautifully crafted apparel is meant to enhance the beauty of the wearer, and D'Estout agreed by saying that her clothing transforms the wearer into a walking work of art. Modern design while staying faithful to traditional woodcraft techniques are the tenets that Scott McGlasson (booth 325) adheres to in his exceptional furniture. The sleek and clean modern style that McGlasson combines with rustic traditions of woodworking create a fascinating contrast in each piece that is appealing to the eyes and improves the interior of any home. 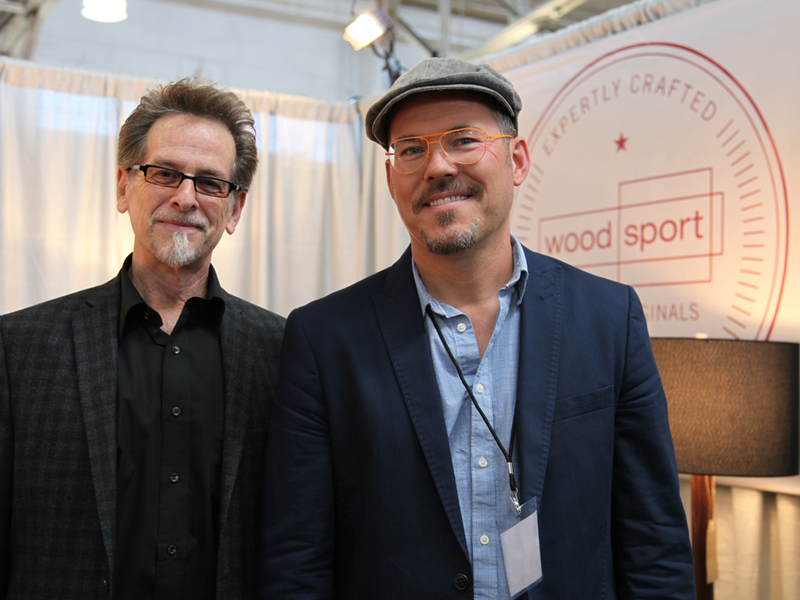 The quality of craftsmanship and innovative approach to wood greatly appealed to D'Estout, which is why he granted Scott an Award of Excellence. This year was McGlasson's first time at the San Francisco show. While Scott has exhibited at other ACC show locations, this was the very first ACC show for the next Award of Excellence winner, jeweler Jillian Moore (booth 625). Her quirky, organic neckpieces and brooches might look like glass to most people, but Moore uses plastics, metal, resin, and other materials to create a shimmering and sometimes translucent appearance for her jewelry, astounding the eyes and surprising everyone with the light weight of the objects. The exceptional talent of the first-time exhibitor is a guarantee of even greater things to come. As mentioned above, the bestowing of outstanding booth design to three different artists was unprecedented for an award that has traditionally been given to one artist. Bucking the trend, however, the booth design for David Whippen, John Liston, and Niki Ulehla (booths 320, 321, and 322) had the three collaborating artists remove the walls that separate most booths at the show and create one extended space that was admired for its clean and minimalist approach that highlighted the impressive furniture and jewelry on display. Whippen, Liston, and Ulehla share a studio in the Bay Area, and their spirit of camaraderie extended to the show and impressed many viewers, including the juror. Congratulations to the Awards of Excellence winner's at this year's San Francisco show, as well as all the artists who brought their talent and creativity to the Golden City. 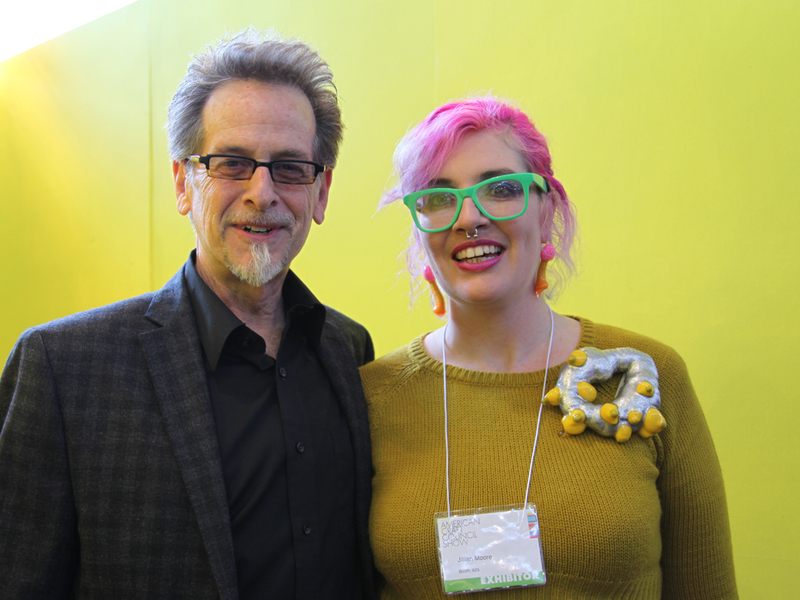 Show juror Marc D'Estout with award winner Jillian Moore. 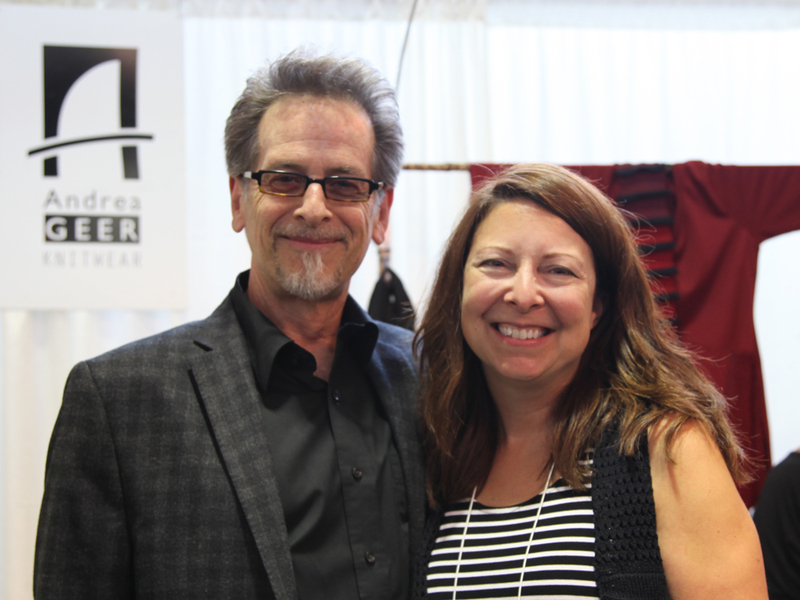 Show juror Marc D'Estout with award winner Andrea Geer. 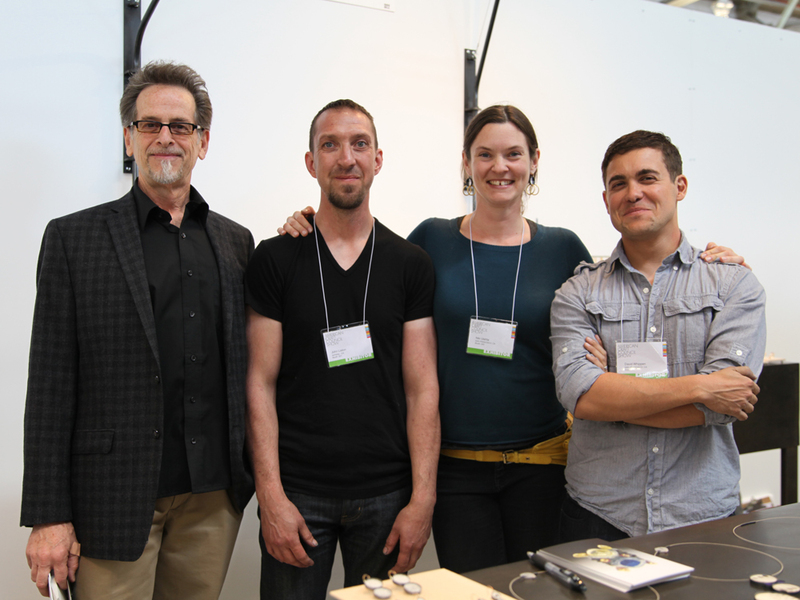 Show juror Marc D'Estout with booth design winners John Liston, Niki Ulehla, and David Whippen (left to right).